Panelists at the "2019 Journalists' Guide" event on Jan. 25 were moderator Emily Holden of the Guardian, Juliet Eilperin of the Washington Post, Eric Lipton of the New York Times, Ellen Gilmer of E&E News, PJ Joshi of Politico and Christina Larson of the Associated Press. Photo: Meaghan Parker, SEJ. Click to enlarge. 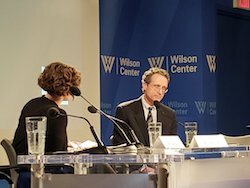 The coming year will be “make or break” for critical decisions on a range of environmental and energy issues, agreed leading journalists at a Jan. 25 event co-hosted by the Society of Environmental Journalists and the Wilson Center’s Environmental Change and Security Program. 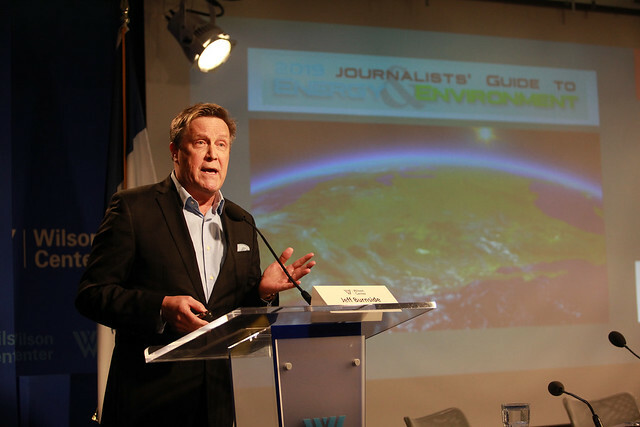 The annual “2019 Journalists’ Guide to Energy & Environment,” held at Washington D.C.’s Wilson Center to an overflow crowd, featured top beat reporters from the Washington Post, the New York Times, E&E News, Politico and the Associated Press sharing tips, insights and prognostications for the coming year. The gathering also featured a last-minute surprise appearance by U.S. Environmental Protection Agency Assistant Administrator for Air William Wehrum, who under questioning by program moderator and Guardian reporter Emily Holden, downplayed climate change as an agency priority. EPA's Wehrum, right, questioned by Holden. Photo: Meaghan Parker, SEJ. Click to enlarge. Wehrum acknowledged he had not read all of the recent National Climate Assessment, which when released last November offered stark warnings of the consequences of climate change for the United States. Wehrum also defended the “Affordable Clean Energy,” or ACE, plan, the Trump administration’s replacement for former President Barack Obama’s effort to address climate change through the Clean Power Plan. And while the Guardian’s Holden wanted to talk about climate, Wehrum seemed more eager to discuss the Mercury and Air Toxics Standard, or MATS, a rule which though almost fully implemented, is being targeted for changes by the EPA. 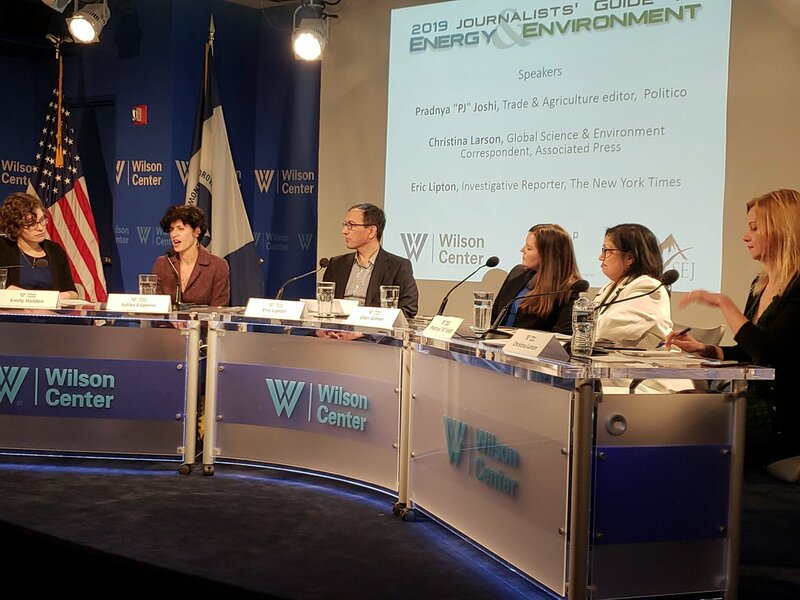 During the weeks before the Wilson Center event, SEJournal published a sweeping “2019 Journalists’ Guide to Energy & Environment” as an online special report. SEJ board member Jeff Burnside delivered an overview of what the year ahead offered, summarizing the guide. Burnside, a former SEJ president, spoke to the expansion of environmental coverage into many new areas of news coverage — this past year partly the result of extreme weather disasters — and said the group functions as a virtual newsroom for building better journalism, especially through its annual conference, this year to be held in Fort Collins, Colo. in early Oct.
SEJ board member Jeff Burnside reviewing the 2019 guide for an overflow audience. Photo: Environmental Change and Security Program, Wilson Center. Click to enlarge. Burnside said that the 2019 guide forsees coverage expanding over climate change and the “Green New Deal.” The number of congressional oversight hearings will increase, while court cases will intensify and debate over rules on coal ash and the Clean Water Act will be contentious. The guide also predicts the rollback of auto emissions standards will remain an issue for coverage, and that the renewables revolution will continue, as will squalls over science, while headlines will be garnered by issues of environmental justice and toxic PFAS in water. The issue of plastic in the environment will be front and center, Burnside added. 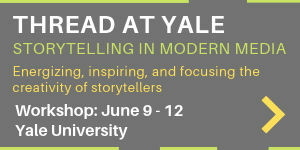 Moderator Holden later queried a panel of five top journalists about stories and issues in the year ahead. Juliet Eilperin, who has covered Congress, the White House and the environmental beat for the Washington Post, said the start of 2019 was a “pivotal moment” for the Trump Interior Department, as the White House needs to decide who would permanently replace Ryan Zinke as secretary. Zinke resigned in December amid scandals. Nonetheless, she said, Interior would forge ahead with the Trump administration’s policies. Key among them, she said, was “energy dominance” — by which President Donald Trump means maximum possible energy production from federal lands and waters. She cited the huge acreage offered for lease last year in Alaska (with few takers) as evidence, along with the opening up of national monuments. The Trump Interior’s “full steam ahead” approach to leasing even during the government shutdown was, she said, a harbinger of what was to come. 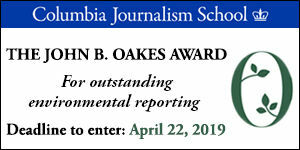 Ellen Gilmer, who edits and reports environmental court cases for the E&E News fleet of newsletters, said she has been busy over the past two years, as almost all of Trump’s environmental rule rollbacks have been challenged in court. That, in fact, is where most of the conflicts will be decided. Pradnya “PJ” Joshi, an editor covering agriculture and trade for Politico, said that climate change would certainly be affecting the agriculture beat as things go forward. She pointed to the way that Hurricane Harvey had impacted Texas cotton, suggesting that ongoing climate change would bring more extreme weather events with impact on that scale. Another example cited buy Joshi was Hurricane Florence’s impact on hog farms and waste lagoons in the Carolinas. The coming year, she said, would bring stories about efforts by companies like Smithfield to cover and reconfigure their waste lagoons. Christina Larson, who has covered science, technology and the environment from a perch in Asia for the Associated Press and other outlets, said China’s energy demands would continue to grow as more of its population is expected to move to cities in years ahead. Larson suggested China might in fact succeed in reducing its air emissions as promised under the Paris Agreement. That’s been a point of some uncertainty, but she said China was strongly motivated, not simply for purposes of climate, but to reduce the choking air pollution plaguing many of its cities. The two-hour event was capped by a reception supported by The Wilderness Society, The Nature Conservancy and Environment America. * From the weekly news magazine SEJournal Online, Vol. 4, No. 5. Content from each new issue of SEJournal Online is available to the public via the SEJournal Online main page. Subscribe to the e-newsletter here. 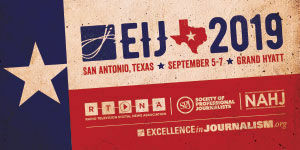 And see past issues of the SEJournal archived here.